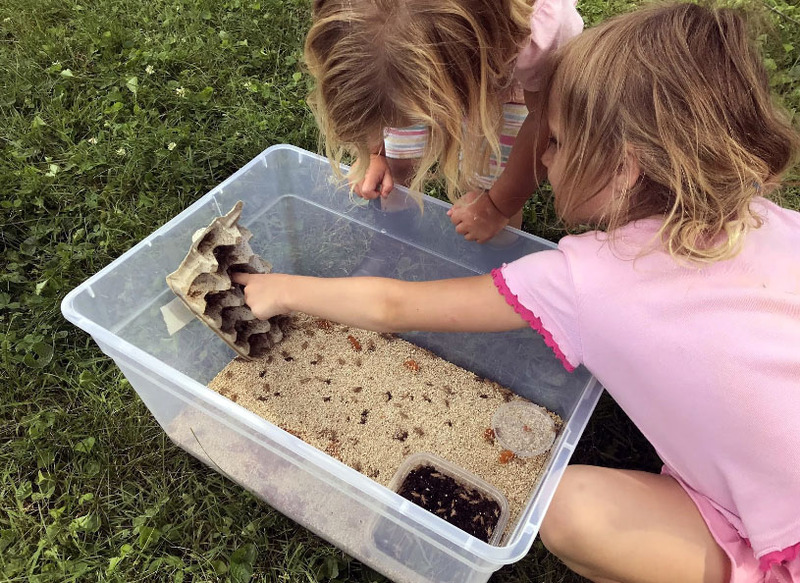 Side Hustle #73: I Sell Crickets Online! I have an unusual hobby. 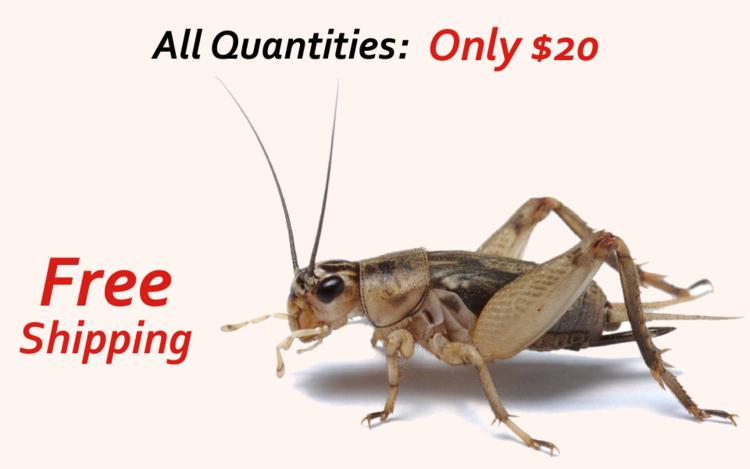 I sell live crickets online. And I know this is unusual because my inner circle of beloved friends and family don’t like to talk about it much (with the exception of my wacky daughters, who can be frequently found playing in the grow bins). 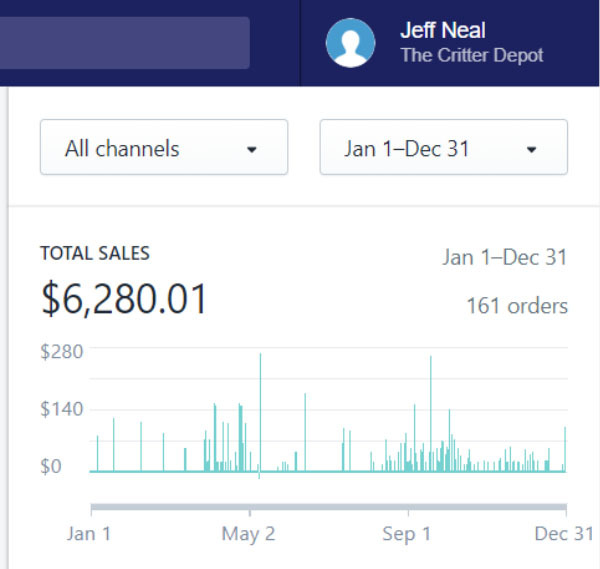 But, as of this year, I’ve reached new sales records, selling about $7,000 worth of crickets per month, which has lined my pockets with roughly $1,200 per month in profit. And although my friends don’t like to discuss it, I fully embrace it – knowing that every shipped cricket is pushing me closer to my dream of financial freedom. 2 years ago when I began selling crickets, I broke the cardinal rule of side hustling: I pursued something I wasn’t passionate about. Not only was I not passionate about crickets, but I didn’t have any interest in their benefactors either: reptiles and amphibians. But one thing that does grab my attention is making money online. And that’s because it’s a relatively passive way to make extra income from anywhere that internet access is available. Best of all, nearly any topic, any sub category, and any product has the potential to generate income! There are a lot of details missing from this list, however this is the basic foundation. Because it’s a popular topic with little competition! This isn’t my first online rodeo, and I can attest that making money online has 2 important requirements: a topic and an audience. And when hunting for that topic, it’s critical that there is very little competition. But it’s just as critical that the topic has an active audience as well. Now the tricky thing is that everyone else knows this online too, so finding the perfect topic or product will require hours and hours and hours of research. Before landing on crickets I started researching binoculars, and then moved to thermal scopes. I then dove right into the meat thermometer industry, and even considered women’s shoes! But after months of investigating, it became obvious that there was no better choice than live crickets. This requires 2 main things: Scoring some graphics and building a website. Logos aren’t necessary, but they can be an inexpensive investment if trying to build a solid brand – particularly if there are competitors as it will help distinguish your product or service from the others. I ended up using Upwork for this, and it only cost me $125. If you find a supplier being over-protective of their merchandise, however, there are plenty of free stock image sites that offer high resolution photos. Once the pictures were secured, it was time to slap them onto a website. Now I have zero programming or computer science skills, which is what makes living in 2018 so wonderful. Website platform companies have streamlined the site building process so well that any cricket-pursuing nitwit can put together a clean, professional looking website. And there’s YouTube for any tutorials as well. But because I was attempting to launch an e-commerce store, I needed help building a merchant website. And Shopify has proven to be an excellent solution, with great customer support. I picked out a theme, selected some fonts and colors, then stitched them all together and in a matter of hours I had a respectable website – fully loaded with product images of live crickets, and even a company logo. But Shopify’s service isn’t free. So if you’re looking to take baby steps into an e-commerce venture, expect to fork out a minimum of $30 per month. There’s also less expensive options, such as using WordPress – a popular blog platform – as well as Weebly and Wix if you’re willing to get your hands dirty. All great platforms that have streamlined the creation process for those just starting out. Once the website was built, it was time to push this puppy in front of the masses. There are 2 basic internet marketing strategies: paid ads and search engine optimization (SEO). Paid ads will instantly position your website in front of interested buyers. But for a recurring fee. Alternatively, SEO doesn’t have to cost anything (unless you hire someone to do it), but it’s a daily grind that requires non-stop focus. And it can take months, or even years, to start pulling in the free traffic. As a boot strapped side hustler, I was committed to keeping my costs as low as possible, so I skipped the paid ads and went straight for the SEO side of things. Which meant hours of optimizing the website, coming up with excellent content, and then going out and finding ways to get that excellent content shared on social media platforms and other websites – such as this one! I hit the books studying as much as I could about crickets. 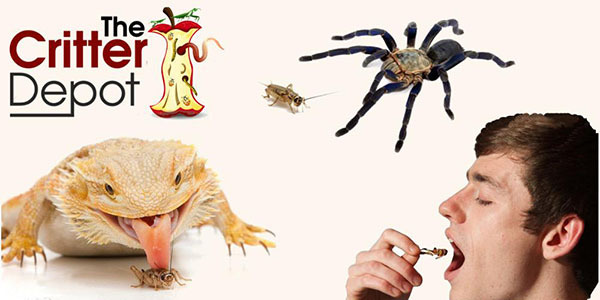 I needed to make informative articles on caring for crickets, feeding crickets, the nutritional benefits of crickets, how to store crickets, how often to feed crickets, what to feed crickets, how to water crickets, how not to drown crickets, how to gut-load crickets, how to breed crickets, and many other long-winded, yawn-inducing articles on the “fascinating” world of being a live feeder. And it was a grind. My first year at it was pretty rough, accurately reflecting the slow grind that is search engine optimization. So I started reaching out to other reptile bloggers and forums, looking to build mutually beneficial relationships with each other. I also solicited advice and information on pet reptile care so I could make my site much more informative and helpful to the interested buyer. 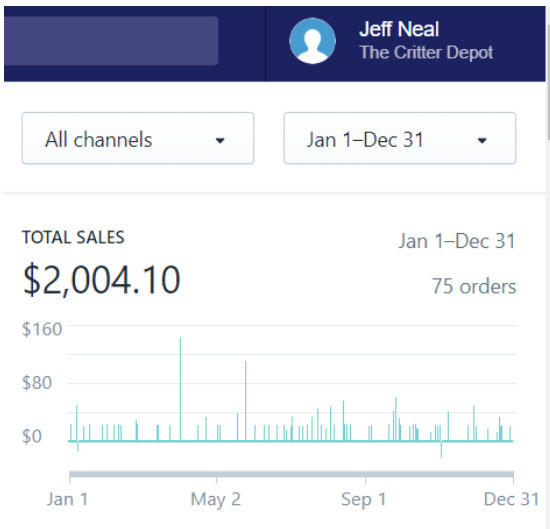 By the end of the year I managed to scrounge up a measly $2,000 in sales, netting me a profit of about $150. In my 2nd year, I pursued the same routine, but unfortunately with less focus. My spare time was limited outside of work and family, so I had to dial back my cricket pursuit which transformed everything into an awkward mess. My social appearances became robotic with scripted interactions, because all I could think about were crickets. My daytime job also became harder, because all I wanted to do was push the website further into the world wild web! But for the small amount of time I did put into it, I still made a few connections and relationships. 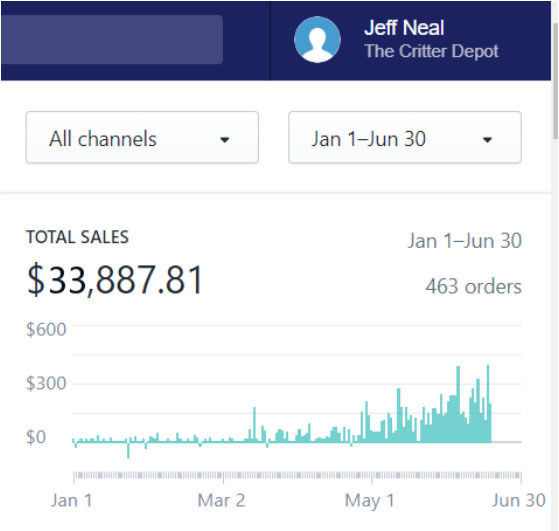 I composed long-tailed articles with hopes of attracting bloggers to share my content, and even though I had a distracted back-burner approach, I was able to triple my sales for the year netting me about $600 in the end. Earlier this year my wife gave birth to our third child. Couple that with upgrading to a bigger house and mortgage, and I was ready to slap myself out of this passive mentality and really see how far I could push this thing. I spent more time searching low competition keywords that yielded high search results. I spent more time and money on composing long-form articles, as well as hiring writers from Upwork to compose long-form articles for me (don’t worry, I wrote this one myself!). And I also spent more time on my social media pages, slowly building a budding community of passionate pet owners who like to discuss and share care-taking techniques for their beloved pets. I also started subscribing to a service called HARO (Help a Reporter Out) where I receive inquiries from online journalists 3x a day who are looking for comments and insight from various experts. I made it a personal goal to reply to a minimum of at least 2 inquiries every day, even though I may not be the best out there. This has helped greatly to get my name and cricket-slinging story out into the wild. I’m also proud to say that the SEO work has finally started paying off. Once Google started crawling all of those long form articles on my site as well as others’, I began seeing a major boost in search engine rankings, which has helped me earn more than $33,000 in sales so far this year. So now, my after-work, after kids-go-to-bed, start-the-day-at-4AM hours include more than just soliciting partnerships and composing content. I now have to send out nearly 100 orders per week, and also have to provide customer service! So I can confirm that side hustlers never sleep. Earning money online isn’t easy, but it’s not impossible. From my experience, finding a topic and sticking with that topic for a few years can really pay off down the road. So although SEO is a grind, fighting through it can reap many rewards as long as that foundation is properly built with a popular topic and low competition. Now who needs some crickets??! Jeff Neal runs TheCritterDepot.com, an online shop that sells some of the happiest, healthiest, heartiest snacks on the internet: crickets. As well as other fine pet treats from superworms to black soldier fly larva. He can be found on Facebook at facebook.com/TastyCrickets, or on Twitter @TastyCrickets. *As part of our Side Hustle Series. Click, or see below, for even more interesting ways to make money! Very clever- but very gross! Fascinating… so he does the growing as well as the shipping? That poor family… I had a leopard gecko for a few years in college. You’d randomly find crickets in the shower, on the ceiling, in the closets… those little buggers can jump! Good for him, but not worth the money to have all those gross critters in my house. Though if I ever get back into reptiles, now I know where to go for their food supply :) Thanks for sharing your story. Awesome story! I am grateful dogs have dried food!. You mention you like to bootstrap as much as you can (which I can completely relate to). However, do you think outsourcing or paying for services would have gotten you to your current profit levels faster? Hmm… I don’t think so. I’ve outsourced SEO work before, and have never received the results I was hoping for. That might be because I was typically hiring low bidders off Upwork. But I can get pretty aggressive, and have spent hours hunting content writers off LinkedIn. I would then email them (or call if they have a number), and discuss possible articles about my hustle. It’s pretty belligerent, but it’s netted pretty good results. And I don’t believe I’d ever be able to hire an SEO person that would be willing to go to that level. Wow, great job growing your side hustle this year. That’s a huge jump from 2017 on a mature business. Why do people think crickets are gross? They not like a cockroach or anything. Thanks. I’ve created a monster, but I’m trying to push this thing even further. Right now, I’m reading “The Everything Store” to really see how a madman operates. I’m not sure why they’re considered gross. They’re actually trending right now as a source for human food! I wouldn’t consider them gross, though I wouldn’t eat them either. More like annoyingly noisy if they get into your home. Use to have that issue with an apartment and it would drive me nuts. Interesting!!!! i grow meal worms for my chickens just to save on money. Hey, i could possibly sell them also as a side hustle lol!! Ps, ive read your blog for a while and love all the tips. I’ve been saving extra and contributing more to 401k since following! Rock on!!! So glad to hear! First off, congrats to Jeff on the new baby and new home! That’s hilarious, never would have thought of raising crickets. I’ve heard crickets are super healthy too, wouldn’t mind trying them if there were a restaurant that served it. I haven’t tried them either. And they do offer some intriguing health benefits. So I wouldn’t mind seeing if they can provide both health and wealth into my household. Thanks for the compliments. I’ve been reading up on Sam Walton and Jeff Bezos, and figured a $20 flat rate price was not only a great price, but simplified the decision process for the buyer. I noticed that too right away – thought it was brilliant! And I bet people still pick the lower ones even if it’s not *as good* a bargain so they don’t waste crickets (am I right?). Bingo. 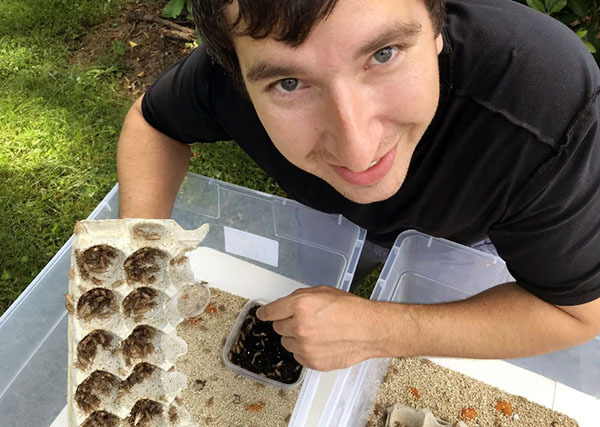 If the caretakers have a younger pet, then it makes more sense for them to select the 500 or 250 count of crickets, because a younger pet won’t intake as much as a mature pet. J.Money, sound like you have some experience in the art of product pricing? As a fellow small ecommerce business owner Could you share insight how this is achievable with your products only being in the low 20$ range? Dude. Helleva story. Thanks for sharing! Previous post: Favorite Financial Nuggets This Month! Next post: Have You Mastered These Three Foundations of Money?